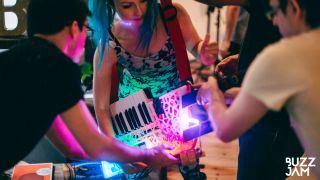 The challenge: six bands help developers to create new musical instruments over 36 hours, culminating in a live performance of the finished technologies. I'd been watching Imogen Heap's Ted Talk video, as she demonstrates her newly-developed interactive gloves with great interest, so when an invite to Buzz Jam at the Red Bull Studios in London popped through, I had to follow up. As someone interested in the blending of music and technology, I'd always felt that the experimental instrument movement, at its best, really gives musicians a chance to craft their live sets in new ways and manipulate an infinite range of sounds in the studio. The Buzz Jam challenge event seemed to be a great excuse to explore the boundaries of new software and hardware in a fun, safe and creative environment. The great thing about experimenting with digital hardware is that the technology doesn't have to be cutting edge either. In an exclusive video showing one performance from the event by artist Good Love, volunteers on tin foil sensors held hands with him, also standing on a sensor which then triggered samples - perhaps an audience participation first. Sean Tracey, coder, explains the lure of these types of collaborations: "Whenever I've paired up with programmers at hack days in the past, a lot of time has been spent discussing implementation details instead of building things and generating ideas, I didn't think that this would be an issue with musicians and it wasn't." Fellow coder, Syd Lawrence, adds: "It sounded really exciting to actually work in the same room as the artist and to work together on developing something awesome." But how hard is it for emotive music and logical programming to blend into something truly new? In answer, a third coder Tom Berman brought up the valid point that the digital has disrupted the acoustic spectrum. "In some ways in music I think we have reached the 'end of tech'...Now we can do 'anything' with sound," he says. Is it a bad thing? Is there something that is lost in the "anything is possible" simulacra of the acoustic by regimented digital sampling, or is it too much of a subversion of soundwaves? Coder Syd weighs in: "I think they will compliment each other. You can't replace the acoustic experience but you can enhance it". Performer Tala prefers to think of technology as an addition to music that helps augment and subvert it. "Music should be something more. Something that we can experience using more of our senses, completely immersive." She also goes on to suggest that the key to this is to meet in the "fun" middle. She explains: "The most important thing when you're using technology to help you create is that it's fun." By the end of the Buzz Jam event the experimental instruments were a little rough and ready but they worked. The process that Chasing Cadence went through to develop their wearable drum-hoodie leads to the hoodie being 'played' successfully, if a little out of time. It suggests that trained musicians may have a steeper learning curve to be as efficient with their new instruments, but there's no doubt the collaboration was a successful one. With the wider availability of Arduino boards, circuitry and online software help, it shouldn't make it out of reach for a new generation wanting to expand their musical possibilities. Syd Lawrence thinks "It's about teaching kids to code and to tinker with technology available to them." He continues, "Technology doesn't have to be expensive if you educated people in different ways to use it and give them the freedom to experiment." Sean Tracy thinks that now is the best time to at least give it a go, explaining: "10 years ago, if you wanted to make an embedded anything, you had to choose a chip, then make sure the software worked with the chip, then maybe even design a power system. Nightmare! Now, someone can pop down to Maplins, spend £30 on an Arduino and some bits and bobs, download some source code from Github and they can make their own drum jacket." What I learned from the event was that if you feel you aren't quite up to delving through lines of code, the best thing you can do is to find a creative partner who is - and it turns out there are a fair few of them about. Musicians and coders both perform a sort of alchemy, turning the static notes and rules of coding into something more instinctual and emotive. The Buzz Jam artists were all up for the challenge, and although results were mixed the overall reaction was entirely positive with some of the artists vowing to continue their collaborations and refine their instruments for future live performances. You can follow Buzz Jam on Twitter for future projects. So it seems a trip to Maplins is in order. Grab a friend, a laptop, some cables and let your imagination take you where you'd never dreamed.